A lush rainforest in the heart of the city, this 1,000-acre park teems with wildlife and natural beauty. 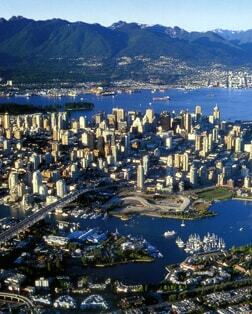 Enjoy a spectacular array of activities, including the famed Vancouver Aquarium and the majestic Totem Pole Park. Take a glass elevator 430 feet in the air to the city's famed lookout and step into the heated observation deck for breathtaking 360-degree views of the city, mountains and your cruise ship below. Experience the vibrant Asian atmosphere in the second largest Chinatown in North America. Authentic architecture, exotic cuisine, and colorful specialty shops make each turn down the narrow alleyways a unique adventure. Connected to the city by a causeway from the south, it was named "One of the World's Greatest Places" by Project for Public Spaces. It is a sophisticated home to performing arts, dining, and a fabulous public market that offers a wide array of fresh food and hand-made crafts. From sophisticated entertainment to unspoiled nature, Vancouver's most visited attraction is the pre-eminent all-in-one destination, with something for everyone. The famous Grouse Mountain Skyride takes you on a one-mile journey to the Alpine Station, 3,700 feet above sea level, where you can choose from a variety of activities. Home to over 70,000 fascinating creatures including majestic beluga whales, Pacific white-sided dolphins, curious sea otters, harbour seals and Steller sea lions! Long-established as a global leader in marine research, education and conservation, the Aquarium offers visitors an unforgettable experience through face-to-face engagement with a wide array of amazing animals. The original site from which modern Vancouver evolved. The varied shops and boutiques make the area a popular shopping district. The famous steam clock fills the air with music every 15 minutes. Vancouver's most famous shopping street set in the heart of downtown is a three-block commercial mecca including premier fashion stores, fine dining and amenities. The street to see and be seen on!